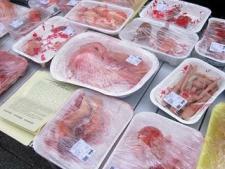 A vegan meal was organized by the group for vegetarianism and veganism of the Basque Country in Bayonne. We spoke about animal consciousness and suffering about vegetarianism, health, meat production and its environmental impact. We gave references to current studies to justify the information that we provided. Two new Belgian activists drove 150 km both ways to come to support us and we plan to organize other events together both in Belgium and in France. Around 15 activists held placards, handed out leaflets and vegan cake to the public for one hour in Leicester Square followed by a second hour at Piccadilly Circus to raise awareness of the concept of meat abolition and a diet free of animal products. 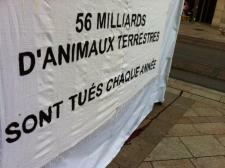 Many people looked at the messages giving the number of animals killed. We felt the action was a very positive one. Auf der Fressgasse in Frankfurt am Main hat die TIRM die Aktionswoche zur Abschaffung der Fleischindustrie durch einen Infotisch und durch das Verteilen von Flugblättern in Schweinekostümen unterstützt. Auf diese Weise haben wir versucht dazu beizutragen, woher tierliche Produkte kommen und darüber aufzuklären, dass man auch komplett ohne diese gut leben kann. Im Rahmen der internationalen Aktionswoche für die Abschaffung von Fleisch hat die TiM am Samstag, den 29.1., am Richard-Strauss-Brunnen den Münchner Passant_innen wieder einmal die grausame Realität des Fleischkonsumes vor Augen geführt. Die Aktivist_innen hielten Bilder von "Schlachttieren" in den Händen, verteilten informative Flugblättern und klärten die Menschen über die fatalen Folgen des Fleischkonsumes auf. 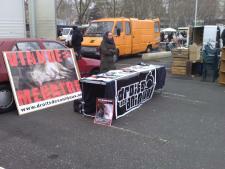 GenevAnimaliste held an information stall in Geneva (rue de la Croix d'Or) on Saturday 29 January, from 9 am to 6 pm. This event, which was the first event organized by the recently-created organization, was rather a success. 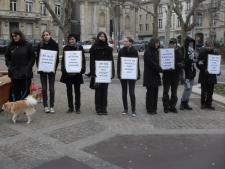 Numerous passers-by stopped by the stall to pick up flyers and enquire about the event, thereby giving GenevAnimaliste's activists the opportunity to explain that meat consumption is not necessary and leads to the suffering and death of billions of sensitive beings each year.